a confirmation vote for the attorney general nominee, william barr. 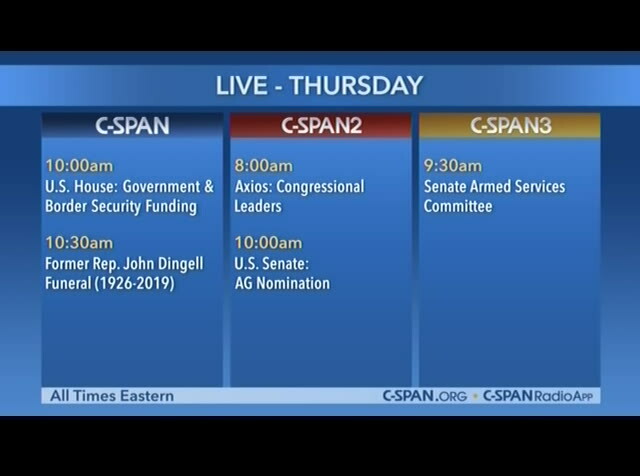 c-span3, a senate armed services committee hearing on the special operations in cyber commands. 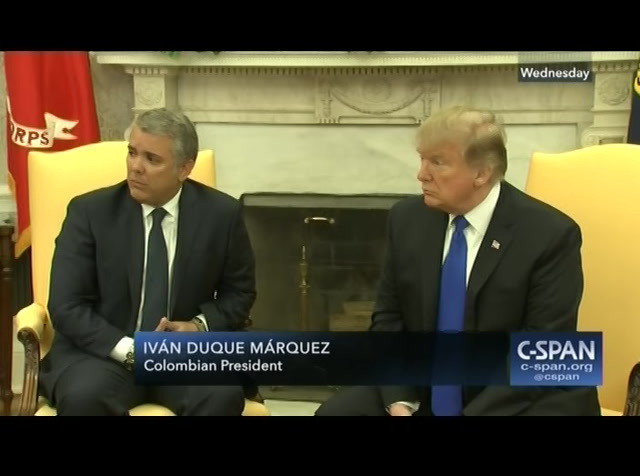 earlier, president trump met with the president of columbia at the white house. 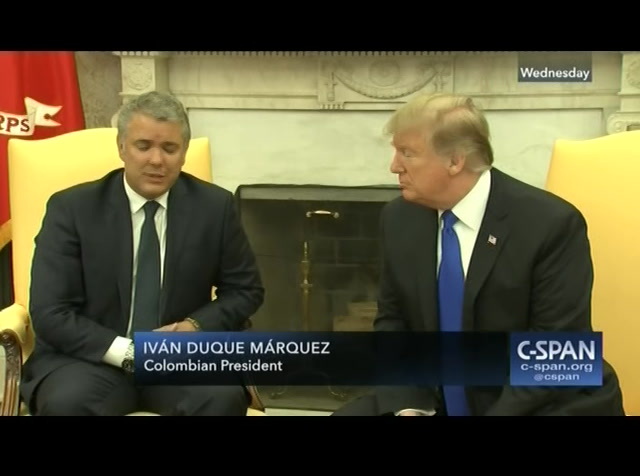 they discussed u.s.-colombian relations and the influx of refugees from venezuela. this is 10 minutes. >> thank you very much. message to the dictatorship. obstructing humanitarian aid is a crime against humanity. 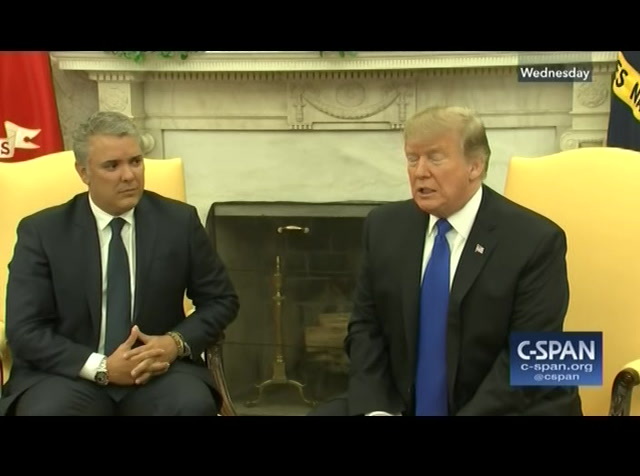 we have to make sure it gets to the venezuelan people and colombia is highly committed to aide to help the venezuelan people. 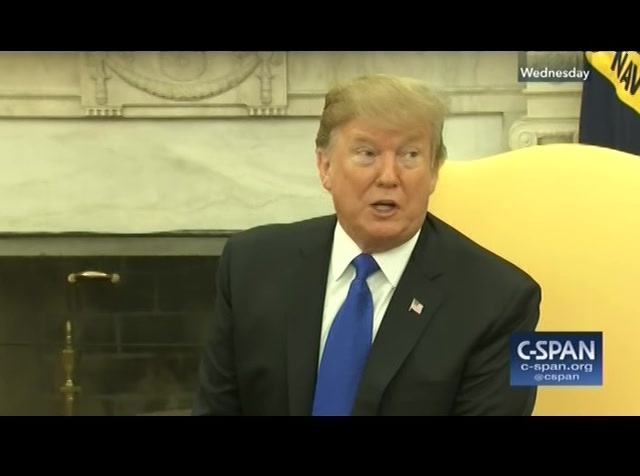 >> [indiscernible] trump: well, we have not gotten it yet. we will be looking for landmines. you could have that. it has been known to happen before to people. we will take a very serious look at it. we have a lot of things happening right now. we building a lot of wall with money we have right now. when people see what we are doing, we will be -- they will be very surprised. we have planned to do a lot of work, but i have not seen it yet. president trump: you will see. 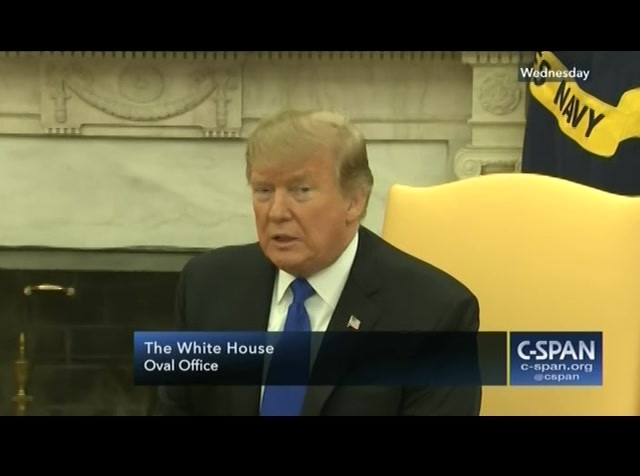 >> [indiscernible] president trump: any other questions? >> [indiscernible] i want to visit colombia. look forward to visiting. something we haven't thought of. it is always interesting. anything ted does is interesting. certainly interesting. 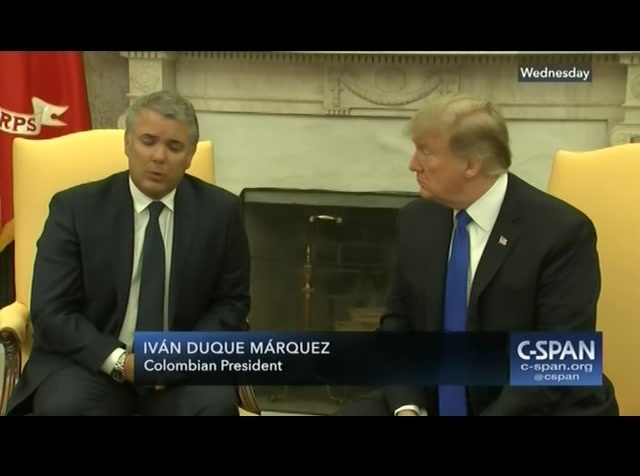 we are working together so that colombia eradicates something they are growing in colombia. i would not say at this moment you're ahead of schedule. >> in the first four months of our administration we have radicated 16,000 -- where than was eradicated in the previous eight months. we have a goal because it is our moral duty to have colombia free f crops and traffic. 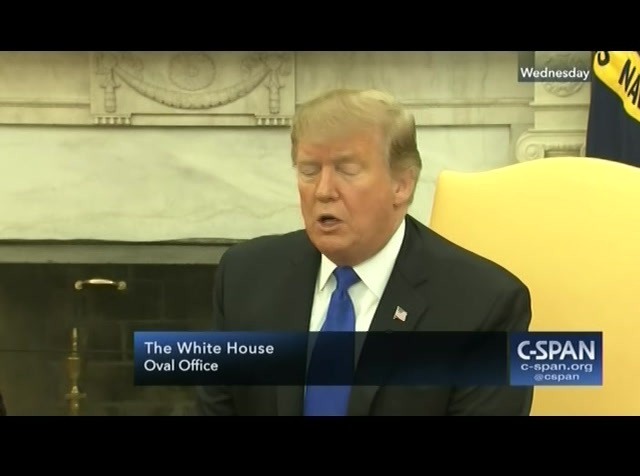 president trump: i want to say before your leave, the economy is doing incredibly well. ? s are really high. really good. we have a big team of people really talented in china negotiating the china deal. it is going along really well. they are showing us tremendous respect and something which a lot of countries didn't use to show the united states. they are showing us respect now. a big difference from the old days, i will tell you that. 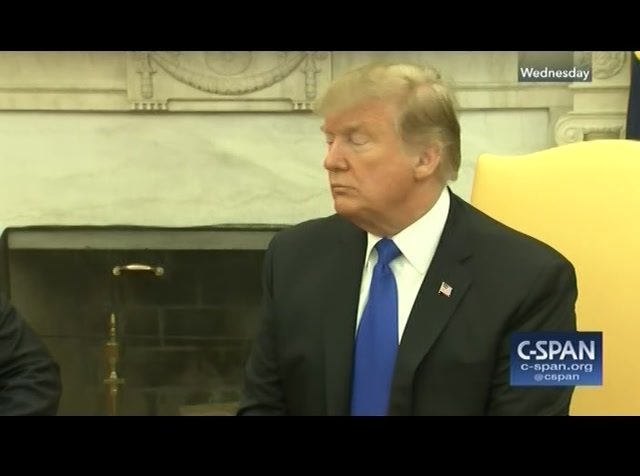 so the deal with china is going very well. 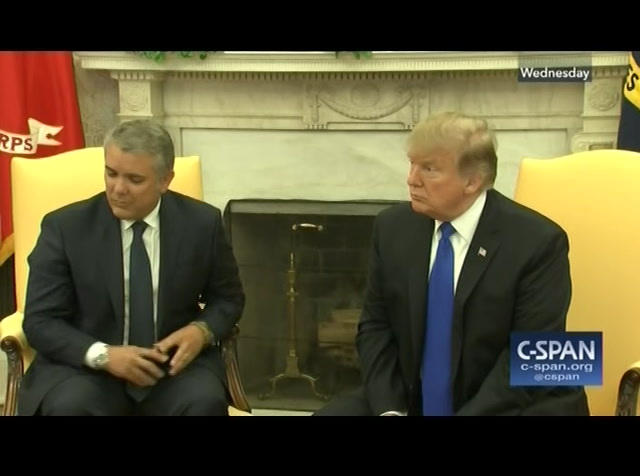 President Trump and first lady Melania Trump meet with Colombian President Iván Duque and first lady Maria Juliana Ruiz in the Oval Office. 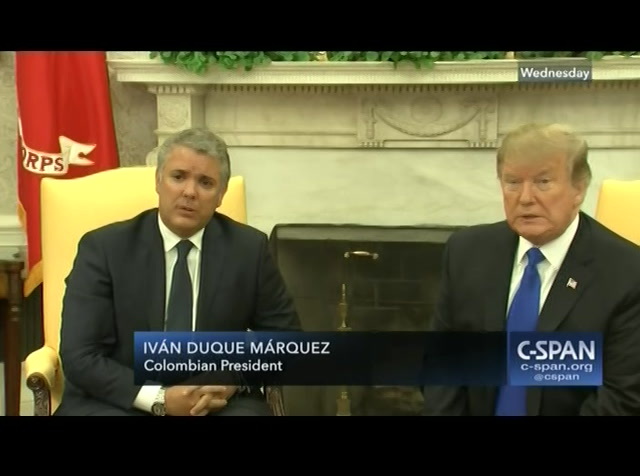 The two leaders discussed U.S.-Colombia relations as well as the political situation in Venezuela. 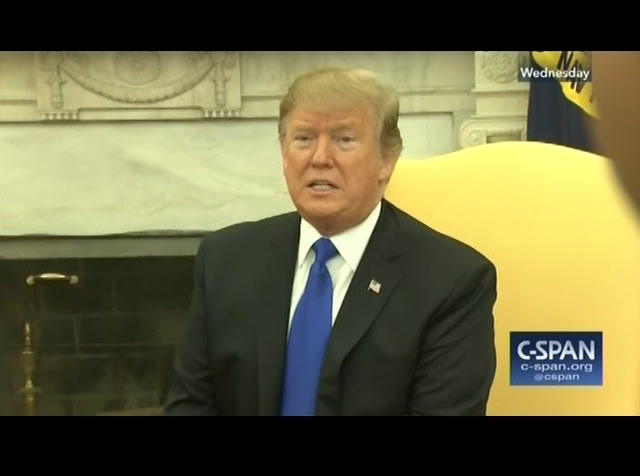 President Trump was also asked whether he would sign a potential border security deal struck by congressional negotiators. "We haven't gotten it yet. We'll be getting it. We'll be looking for land mines," he said. "I don't want to see a shutdown. 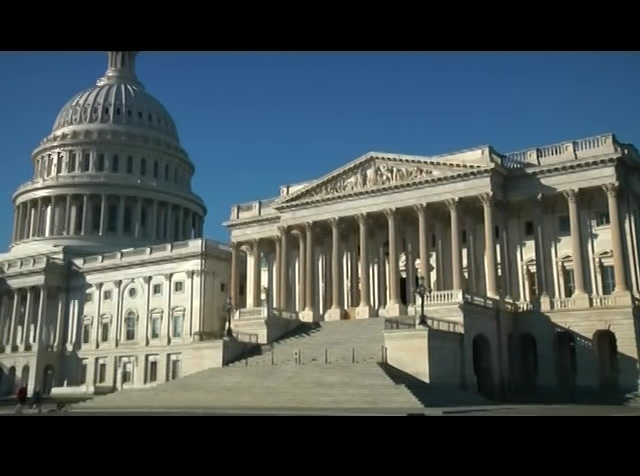 Shutdown would be a terrible thing."